I'm just wondering what's on the seller's mind on why he/she wrote the menu this way. Anyway, I miss these foods. I used to eat them during my college days. My course is very demanding when it comes to time that's why those foods on the list is perfect for students who are always on the go. By the way, I got the picture from Facebook. It brings back memories. How I wish I could go back to Morayta and eat street foods again. Waahhh.. kaloka ang menu!! Putlong? 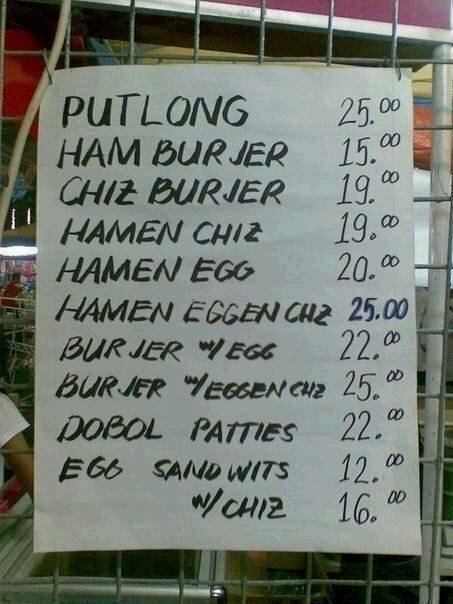 Dobol patties? Hahaha.